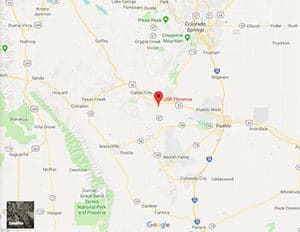 Location: USP Florence is located on State Highway 67, 90 miles south of Denver, 45 miles south of Colorado Springs, and 40 miles west of Pueblo. Background: Opened in 1994 USP Florence is part of the Florence Federal Correctional Complex (FCC). Notable inmates include Ross Ulbricht (serving a life sentence for money laundering, computer hacking, and conspiracy to distribute narcotics as the founder and operator of the Silk Road website) and Walli Mujahidh (serving a 17-year sentence for conspiracy to murder US military officers). Housing: Inmates are housed in one-person and two-person cells. Health Services: Sick call, dental call, physical examinations, medications, chronic care, preventive health services, emergency services, and diagnosis and treatment of chronic conditions, and mental health care are provided to inmates. Emergency medical care is available 24 hours a day. Inmates must submit a triage form for routine health care needs. Psychology Services: Psychology services at USP Florence include screening, assessment, and treatment of mental health and drug abuse problems, individual and group counseling, psycho-educational classes, self-help and supportive services, and referral to Health Services for medical treatment of a mental illness. Inmates can request treatment either through cop-out or by visiting the Psychology open house. The facility also offers the STAGES Program for inmates with serious mental illness and personality disorders. Residential Drug Abuse Program (RDAP): USP Florence does not house a Residential Drug Abuse Program (RDAP), but referrals can be made to institutions which do provide RDAP. A Drug Abuse Education Class, and the Non-Residential Drug Abuse Program (NR-DAP) are provided. Education Services: USP Florence provides GED and English-as-a-Second Language (ESL) programs. Incentive awards are provided to recognize inmates making satisfactory progress and successfully completing the literacy (i.e., GED and ESL) program. Inmates may also receive incentives for progressing to various levels in the GED or ESL programs. Graduation ceremonies recognize GED, ESL, and Occupational Education completions. Courses are also available in Adult Continuing Education (ACE) and parenting. High school diplomas and post-secondary programs are available through paid correspondence programs. Advanced Occupational Education: USP Florence does not offers any advanced occupational education programs. Vocational Training: USP Florence does not offer any vocational training programs. Apprenticeship: USP Florence does not offer any apprenticeship programs. Library Services: Leisure libraries offer inmates a variety of reading materials including periodicals, newspapers, fiction, nonfiction, and reference books. An interlibrary loan program with local, state, and college libraries and available bookmobile services is also available. Inmates are provided legal materials and an opportunity to prepare legal documents with the use of the TRULINCS Electronic Law Library. Inmates also have access to typewriters and a copy machine. UNICOR: USP Florence does not house a UNICOR facility. Commissary: Inmates may use funds in their trust fund account to purchase items at the institution commissary, place funds on their inmate phone account, purchase TRU-Units for their TRULINCS account, or send funds in another manner. Inmates are permitted to spend up to $360.00 per month. Items such as food, beverages, clothing, electronics, and over-the-counter medications can be purchased in the USP Florence commissary. Recreation Services: Leisure activities include organized and informal games, sports, physical fitness, table games, hobby crafts, music programs, intramural activities, social and cultural organizations, and movies. Art activities includes paintings and sketches rendered in any of the usual media (e.g., oils, pastels, crayons, pencils, inks, and charcoal). Hobbycraft activities include ceramics, leatherwork, models, clay, mosaics, crochet, knitting, sculptures, woodworking, and lapidary, etc. Wellness programs include screening, assessments, goal setting, fitness/nutrition prescriptions, and counseling.